Teesside University's MEng (Hons) Aerospace Engineering degree builds on the extensive range of subjects included in the BEng (Hons) by providing advanced topics in aerospace engineering including advanced aerodynamics and complex UAV design projects. 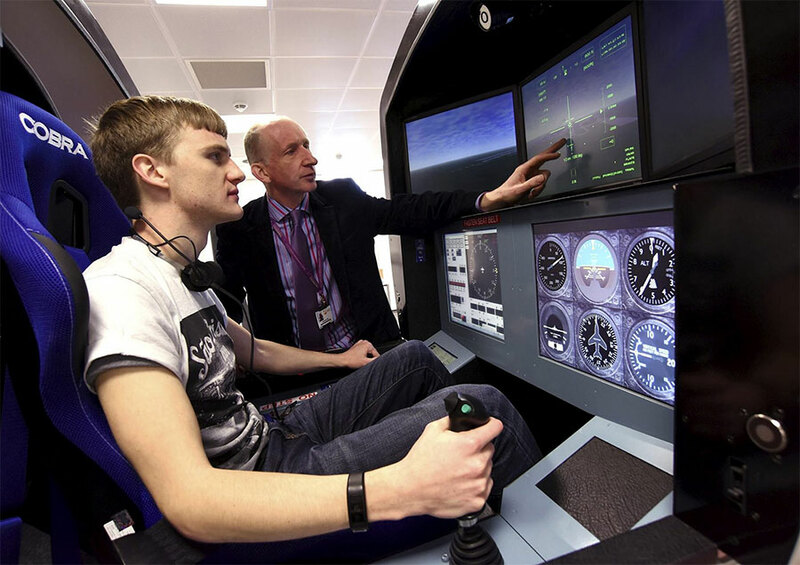 You can also choose from a range of options in advanced subjects which include rotorcraft, flight simulation, computational fluid dynamics and production management. You are taught by experienced staff with backgrounds in either industry, Royal Air Force or Royal Navy Fleet Air Arm who bring real-life experience to the classroom. 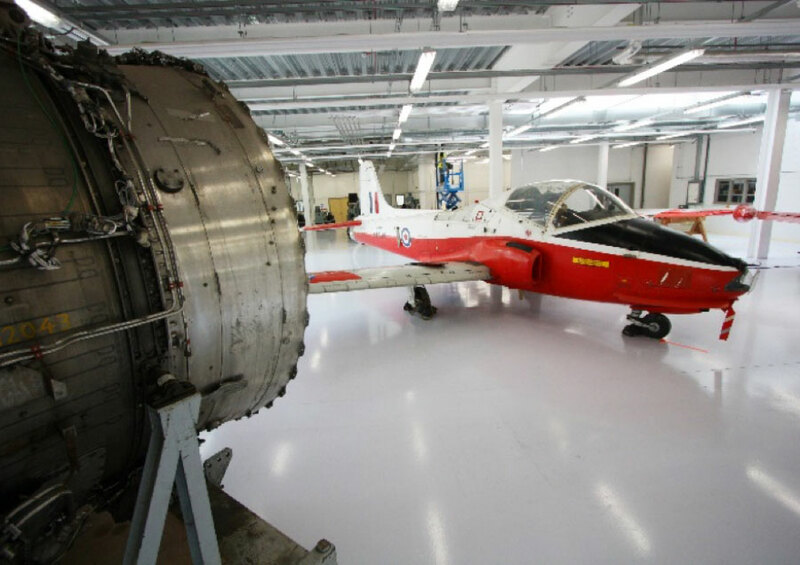 You have access to a wide range of laboratories which include flight simulators, a wind tunnel, fixed and rotary wing aircraft and a number of aircraft components. The course also incorporates a free flight test course in the second year. You fly in a Jetstream aircraft acquiring flight data as the aircraft undergoes a series of pre-planned manoeuvres. The data is used, together with theory covered in the classroom, to calculate the flight and performance characteristics of the aircraft. Transportation, accommodation and the flight tests are provided free to Teesside University students on this programme.Your degree programme combines an employability-enhancing curriculum with significant practical work, small manageable group sizes, and friendly and accessible lecturers. This degree is accredited by the Institution of Mechanical Engineers under licence from UK regulator, the Engineering Council. Accreditation is a mark of assurance that the degree meets the standards set by the Engineering Council in the UK Standard for Professional Engineering Competence (UK-SPEC). The MEng fully meets the exemplifying academic benchmark requirements for registration as a Chartered Engineer (CEng). Students completing an IMechE accredited degree are deemed to have met part or all of the academic requirement for registration as a Chartered or Incorporated Engineer and are in a strong position to move on to achieve professional engineering status after a period of initial professional development in industry. From Year 1, you can join the Institution of Mechanical Engineers as a student affiliate member. Your membership grade depends on your experience and qualifications. As you progress, you can apply for a membership upgrade. This is a group project module which is part of the group project theme running through the engineering programmes. This module introduces you to the practice of creating an engineered design and the organisational issues of controlling a group project. It will provide you with the opportunity to work in a team in order to solve a well defined problem. It will give you an understanding of their knowledge and limitations and the importance of working with other members of a team. There is one week long assignment period allocated to this module and this allows the real time application of skills and knowledge developed in the preceding weeks to be applied to enable manufacture of the designed product. Each group of students will be expected to produce a tangible output from the design and manufacturing work which will account for 60% of the module. For the remaining 40% of marks you will be assessed on the group work process. This is a multi-disciplinary module on fixed-wing aircraft. It covers fundamental concepts of the rigid-body aircraft and its degree of freedom. The main purpose of the module is to introduce the student to the calculation and analysis of aircraft flight performance and stability, with focus on steady-state or quasi steady flight. The flight conditions considered include ground manoeuvre, take-off and landing, cruise condition, and turning. The module will be delivered in a combination of lectures/ tutorials and experimental flight programme. The module will look to establish preparatory experimental design, implementation and analysis of flight data. This module will be assessed by a combination of in-course assessments and an examination. This module studies the relationships between the external loads applied to a deformable body and the intensity of internal forces acting within the body, and the characteristics of the materials often found in aerospace applications. The subject also involves calculating the deformations and stability and stability of a body when the body is subject to external loadings. The module will develop the essential theory and fundamental principles of structural mechanics and will provide an insight into different materials and their characteristics, thus developing student knowledge, skills and ability to apply this knowledge in aerospace structural analysis and design. Lectures on basic principles and then applications through analysis and laboratory experiments. There is an increasing emphasis on self learning and the use of computational simulation. Assessment will be in the form of written laboratory reports and an examination. Avionics and aerospace systems are major constituents of all modern aerospace vehicles on which their overall performance and safety is critically dependent. This module considers the development of avionics, investigates the principles that underpin avionic systems operation and examines the current types and applications of avionic systems in use. The module develops your understanding of the engineering issues related to the specification, design and operation of aerospace systems and their overall performance and safe operation by providing an introduction to the types of systems found on aerospace vehicles and their main functions. The module introduces the fundamental principles and concepts for avionics design including radio and radar technology, navigation systems, flight management systems and automatic flight control systems and focuses on the design and operation of hydraulic and flight control systems using standard engineering tools. We use a variety of learning and teaching methods to create and maintain your involvement including lectures, practical activity using a flight simulator, assignments, presentations, seminar exercises and tutorials. The module is assessed via an assignment and end-of-course exam. Engineers are responsible for the design, construction, and testing of the devices we use. In doing so, they need a deep understanding of the physics that underpins these devices, and must be familiar with mathematical models that predict system behaviour. You learn how to analyze and predict the behaviour of physical systems by studying mechanics. Dynamics is a branch of elementary mechanics that studies the object in motion. The results obtained from dynamics directly apply to many fields of engineering. This module develops the essential theories and fundamental principles of dynamic and vibration analysis, and enhances your knowledge, skills, and ability to apply them to the analysis of dynamic and vibration problems. Aerodynamics is an applied science which finds practical application in many areas of engineering. Irrespective of the complexity of a particular problem, the use of aerodynamics is typically aimed to provide insight into either the loadings on a body moving through air or determination of airflows moving through or around physical systems. This module aims to give a broad introduction to aerodynamics, developing the fundamentals of the discipline and applying these to a number of examples and case studies involving both streamlined and bluff bodies. A key aspect of the module is to provide practical experience of the use of computational fluid dynamics (CFD) software to analyse a variety of flows. Lectures will be used to introduce techniques and underlying principles. Tutorials will provide the opportunity for you to deepen understanding and develop competence in the application of these. Assessment is by an in-course written report and an end examination. This module aims to introduce the equations of motion for rigid symmetrical aircraft, to develop simplified models for characteristic motions and to enable students to understand the response of an aircraft to control inputs and disturbances. It develops the concepts of classical control and applies these to controlling an aircraft. The module also introduces the notion of computer programming as a tool to enable development and design in flight dynamics and control. The module will be delivered via lectures, seminars and IT laboratories. Assessment will be via an assignment of no more than 1500 words and a 3 hour time-constrained assessment. This module introduces you to the initial and parametric design of subsonic aircraft. Lectures guide you through the principal steps of these early stages of an aircraft design whilst, in parallel, you work through the process in small groups as you design an aircraft to a given specification. The module is delivered through a combination of lectures and tutorials using flight simulation and model aircraft to demonstrate performance against the specification. You are assessed through coursework alone. You are required to produce a short individual report on your initial design concept and, at the end, submit a detailed group report demonstrating the performance of your aircraft and the principal facets of its design and construction. This module will provide you with the opportunity to work in an interdisciplinary team in order to solve a complex, employer-relevant problem. It will give you an understanding of your knowledge and limitations, and the importance of bringing in and working with people with a different knowledge base and skill set. Working in an interdisciplinary team will enable problems to be successfully resolved which otherwise would not have been possible within a single disciplinary team. It will develop a consolidated set of employability skills in project management, presentation of work, research and commercial awareness in order to support complex problem solving in a technical context, and enhance the awareness of professional issues such as health, safety, environment and ethics in the workplace. A problem-based learning approach is adopted and where appropriate, supporting lectures/ seminars will be delivered to include technical knowledge or skills development. You will be assessed through two in-course assignments. Rotary wing aircraft are commonplace in the aviation industry ranging from light helicopters to hybrid tilt rotors. This module considers the development of rotary wing aircraft and investigates current types and roles. 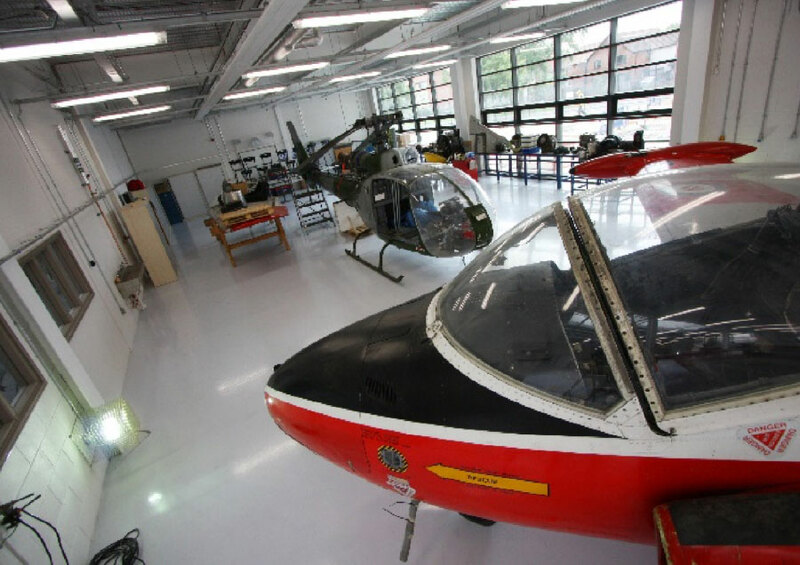 It aims to extend the range of student’s knowledge and skills within the context of the design and operation of rotorcraft in aerospace engineering. It will involve the fundamental concepts for rotorcraft design including flight dynamics, rotor systems, flight performance, stability and control. It will provide experience in design procedures used for rotary aircraft design. 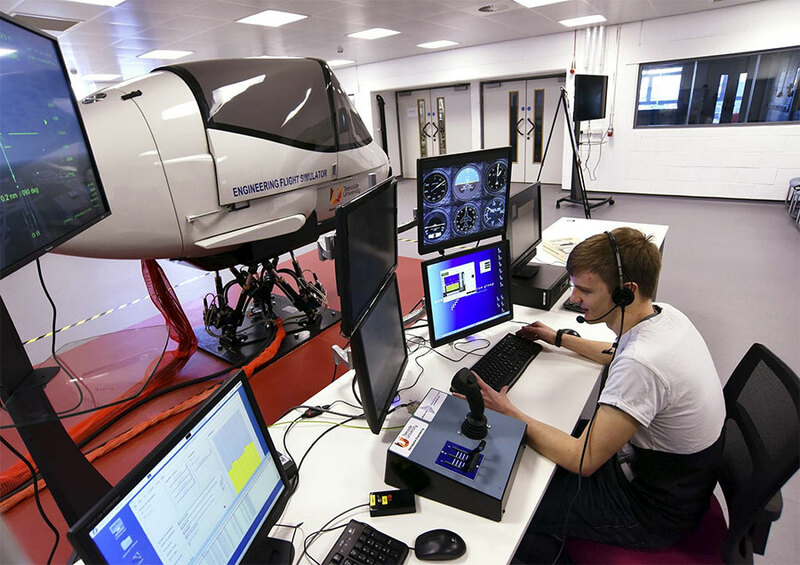 A variety of teaching and learning methods will be used to create and maintain student involvement including lectures, practical activity using a flight simulator to illustrate aerodynamic performance, seminars, problem solving exercises and tutorials. The module will be assessed by an assignment of no more than 2400 words and a 3 hour time constrained assessment. You are expected to attend a range of lectures, small-group tutorials and hands-on laboratory sessions. Your programme also includes a substantial individual research-based project in the final two years of the programme. The programme provides a number of contact teaching and assessment hours (lectures, tutorials, laboratory work, projects, examinations), but you are also expected to spend time on your own - self-study time - to review lecture notes, prepare coursework assignments, work on projects and revise for assessments. Each year of full-time study consists of modules totalling 120 credits, and each unit of credit corresponds to 10 hours of learning and assessment (contact hours plus self-study hours). So, during one year of full-time study you can expect to devote around 1,200 hours to learning and assessment. 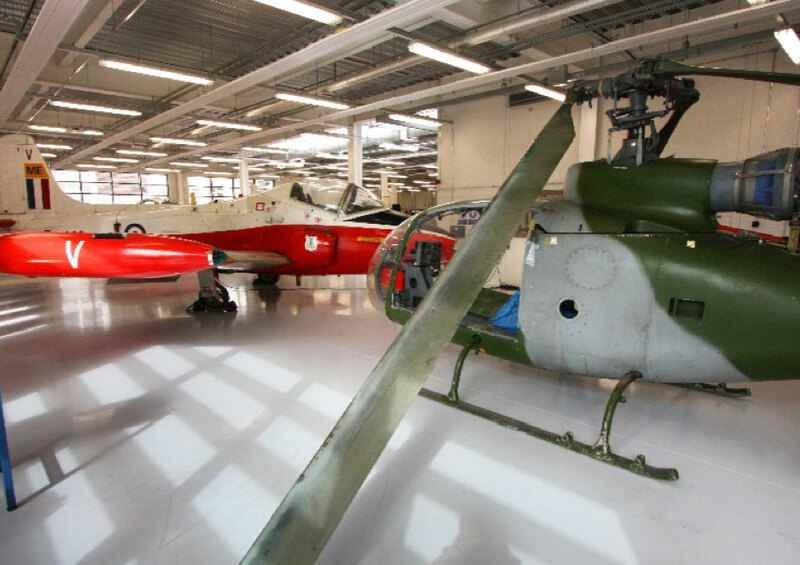 As a student on a Teesside University aerospace engineering programme you have access to the facilities of both Teesside University and Hartlepool College of Further Education. 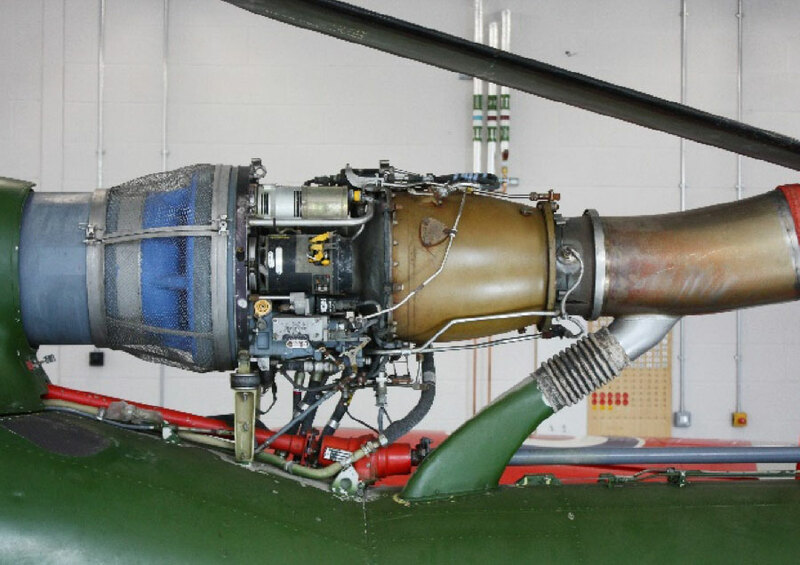 In addition to the structural, manufacturing, materials, flight simulation, jet engine and fluids laboratories at the University you also have access to extensive aerospace engineering facilities at Hartlepool, which include an aerospace workshop, several fixed wing and helicopter aircraft, training rigs and equipment for aircraft systems (including modular radar), plus several engines including a Rolls Royce RB211 turbofan, a viper turbojet and a Turbomeca Astazou turboshaft engine. You will have the opportunity to run a jet engine to record data and analyse its performance, including component and overall engine efficiencies and thrust. 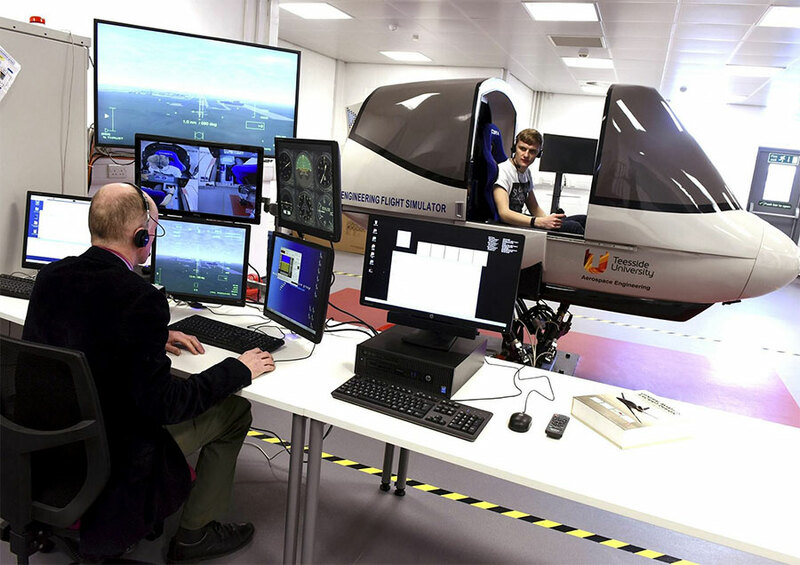 You also use a flight simulator system, subsonic wind tunnel and state-of-the-art IT and computing laboratories where you will conduct aerospace modelling and simulation exercises. You typically spend four out of five days a week in classes and laboratories at the University, and on one day each week transport is provided to take you to our facility in Hartlepool where you utilise the laboratories, facilities, workshops and aircraft to perform group design and project work, as well as laboratory work associated with some of your technical modules. Your programme also includes a flight test course which involves you flying in a Jetstream aircraft fitted with instrumentation for data gathering. You acquire data as the aircraft performs a range of manoeuvres you use this data to perform aircraft performance analysis using the theory you have covered in classes. 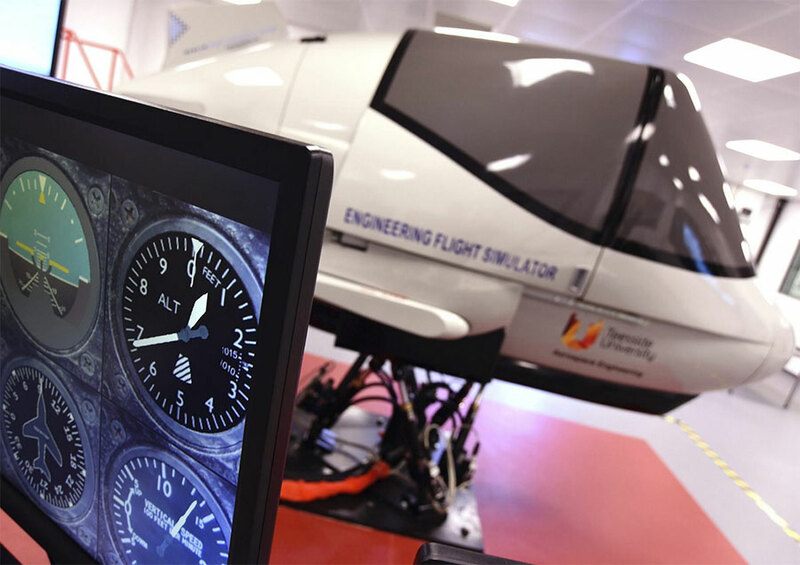 The skills you learn in the air can then be reinforced by using the engineering flight simulator in which you can plan and conduct your own flight trials to explore the effect of changes to an aircraft’s configuration on its performance. The cost of the flight test course and transportation between the University campus and facilities in Hartlepool are included in the normal tuition fees so there is nothing extra to pay. Your programme includes a range of types of assessment including coursework assignments, project reports and formal examinations. 112-128 UCAS tariff points from any combination of recognised Level 3 qualifications including mathematics. The preferred second subject is physics, but alternative science subjects, technology and engineering subjects are also acceptable. In addition to the aerospace industries your skills and knowledge will also be relevant to the automobile, engineering process, oil and gas, electronics, electrical engineering and renewable energy industries, to name just a few. 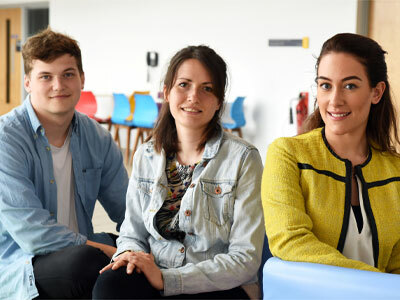 Students involved in research at Teesside University have been invited to present their work at a national conference. 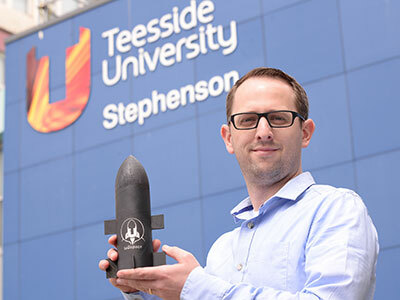 A ground-breaking project to launch a rocket into space by a group of Teesside University engineering students – preparations are already being made for a rocket launch later this year.